Yesterday, NAHB hosted its bi-annual Construction Forecast Webinar (CFW). The CFW featured three industry experts. NAHB Chief Economist David Crowe was joined by Maury Harris, Chief US Economist at UBS, and NAHB Senior Economist Robert Denk to present views on the outlook for the US economy and the housing market more specifically. David Crowe, Chief Economist at NAHB, highlighted the importance of an improved economy for a continuation of the housing market recovery. Recent growth in GDP and payroll employment as well as a decline in the unemployment rate were cited as evidence of current economic strength, and these trends are expected to continue. The demand side of the housing market equation has shown signs of improvement. Consumers have expressed greater confidence and have followed up this sentiment by purchasing durable goods such as home furnishings and automobiles. Despite slightly higher interest rates, housing remains affordable. 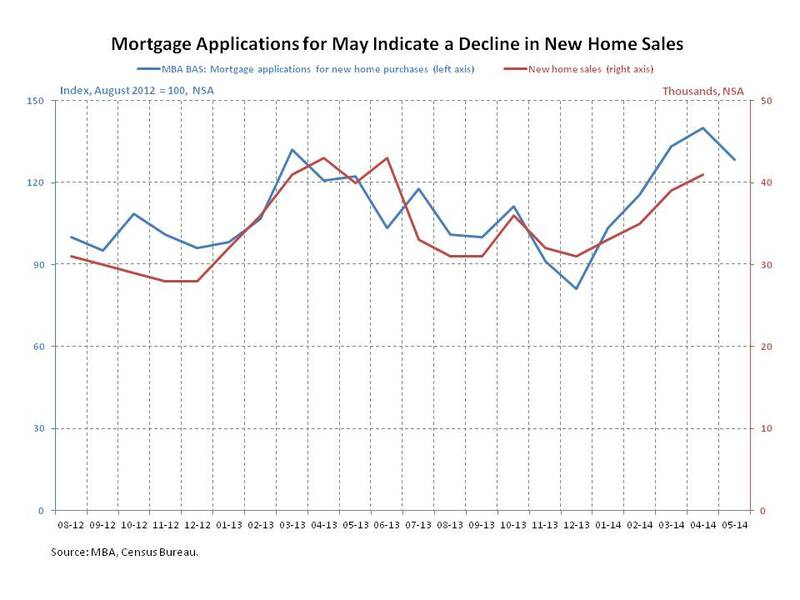 Nevertheless, home builders still face significant headwinds. These include lot supply and labor availability. Credit access has improved, but likely hasn’t returned to normal. However, these supply-side constraints should recede over time. Taken together, improving economic fundamentals combined with a more optimistic consumer and an increasing need for new homes should support a continuing recovery in the housing market. Maury Harris, Chief US Economist at UBS, expressed the view that a housing market recovery and broader economic recovery will depend on the availability of credit. He noted that banks currently have about $2 trillion in lending capacity courtesy of monetary policy, but that lending standards remain tight. As the risk associated with lending shrinks, banks will increase their willingness to lend, which should support job growth. He presented evidence that the easing process may have already begun; financial market measures of risk are declining and lending standards are beginning to ease. Ultimately, as the employment situation improves, especially for “millennials”, household formations should expand and pent-up demand should be released, resulting in greater home sales and higher home prices. As a result of eased lending standards and an expanded capacity to lend, both the housing market and broader economy are expected to strengthen. Robert Denk, Senior Economist at NAHB, agreed with the general consensus that the housing market recovery should strengthen over the next few years, but noted that the recovery will vary across the country. The regional variation partly reflects the depth of each state’s housing market contraction. States where the contraction was greater will take longer to recover, while states that experienced a relatively shallow decline will recover more quickly. Second, the extent of the housing bubble, symbolized by a house price-to-income ratio, varied amongst states. States such as Florida and Nevada experienced a ratio that was double their longer-term average while states such as Wyoming and Kansas saw their ratio peak at less than 20% above their long-term average. Regional variation will also be affected by foreclosures, both the level of foreclosures and the speed of the foreclosure process. States with a larger foreclosure inventory will take longer to rebalance supply and demand and return to normal levels of production. At the same time, eliminating the foreclosure inventory is more difficult in states that have a judicial process in place to govern foreclosures. Finally, regional variation will result from the strength of each state’s underlying economy. Housing production will be better supported in states with a more robust rate of economic growth. Property tax systems vary markedly in the United States. From assessment ratios to valuation standards even the terminology is inconsistently applied. The differences exist not only across states but often within states. In Illinois, for example, real property is assessed at 33.33% of fair cash value for all counties except those with a population of more than 200,000. Thankfully, keeping track of these differences has been made less difficult with the help of the Lincoln Institute of Land Policy. The Lincoln Institute of Land Policy is a private operating foundation whose mission is to advance the study of land policy and land related tax policy. The foundation maintains an online database of Significant Features of the Property Tax. The online database provides information on the property tax systems of all 50 states and the District of Columbia. Topics tracked include property tax fundamentals, property tax base, property tax relief, and incentive programs. Property tax fundamentals are further divided into property tax rates, tax limits, real estate transfer charges, and legal definitions of property. The property tax base is divided into tax base by property type, value standard, and assessment ratios. The on-line database is free and allows users to create tables for selected topics. The exportable tables make it easy to compare property tax features across states and years. The resource is useful not only for academics but also for homebuilders interested in quickly comparing property tax systems or builders interested an unfamiliar property tax environment. A sample of the type of data available is provided by selecting the link below (Significant Features – North Carolina & Texas). It is important to note the that on-line database provides more information including descriptions of residential property tax relief programs, descriptions of tax limits, and statute or tax code. Don’t forget that NAHB’s website is also a good source of free property tax information. After persuading the Census Bureau to include summary property tax statistics in its American Community Survey data base, NAHB regularly uses these data to calculate effective property tax rates in a consistent manner for areas across the country. NAHB’s August 2011 Special Study, for example, published effective property tax rates for cities and counties. 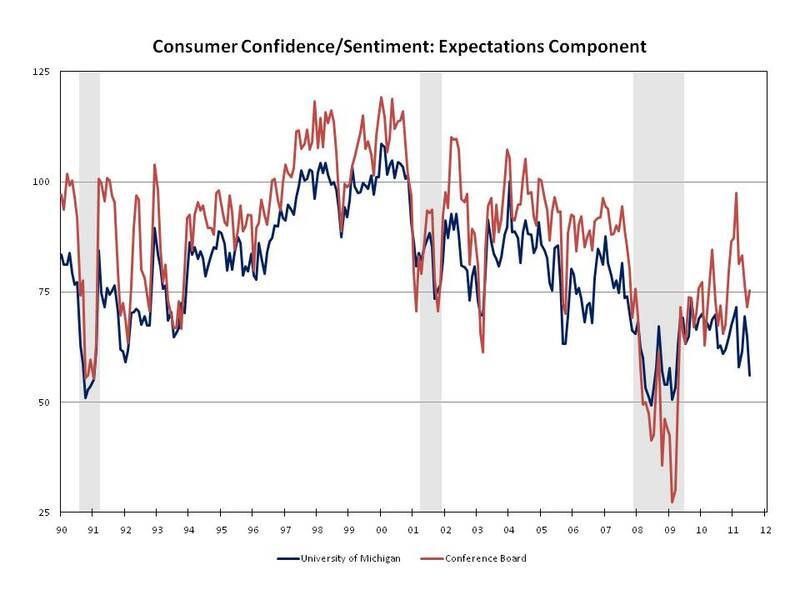 The two major surveys used to measure consumer confidence, the Conference Board’s Consumer Confidence Index (CCI) and the University of Michigan Consumer Sentiment Survey, offered conflicting opinions on consumers’ assessment of future economic conditions. 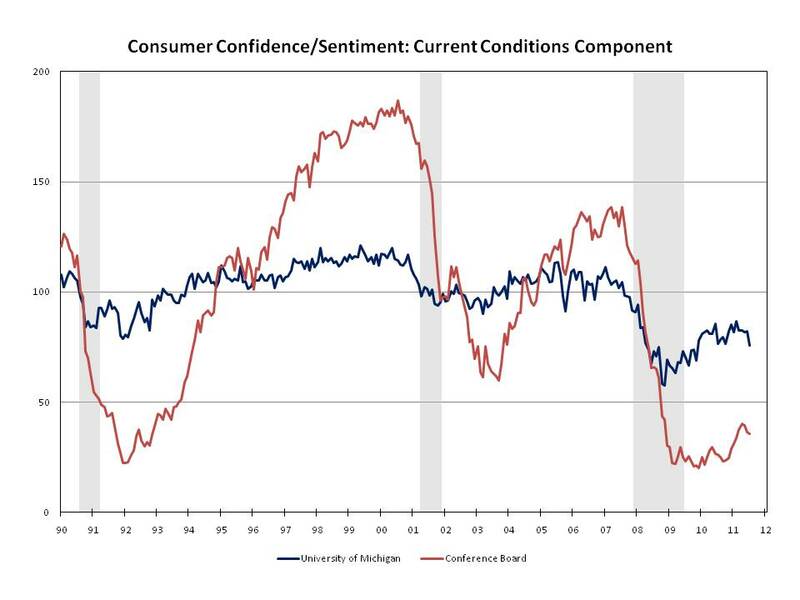 The CCI showed consumers becoming slightly more optimistic about future economic activity while the University of Michigan survey’s expected conditions component plunged 13.6% to its lowest level since March 2009. Nonetheless, respondents in both surveys appeared united by giving decidedly negative appraisals of current economic conditions. This indicates that consumers continue to feel the strain from what remains a lackluster economic recovery. The well-documented struggles of the labor market are having a significant influence on consumers’ perceptions of current economic conditions. A meager total of 18,000 new jobs were added on net during June and employment growth has averaged ~126,000 per month since January. This is well below the pace of new job creation needed to bring down the unemployment rate, which itself climbed to 9.2% last month. According to the CCI, 44.1% of respondents indicated jobs were hard to get and 21.8% reported that they expect fewer jobs to be available in 6 months. Among the sectors covered by the survey, manufacturing activity expanded across the majority of Fed Districts and received a bump in a few areas as the auto manufacturing supply chain disruptions started to wane. Nonfinancial services companies were generally optimistic throughout the nation, with high-tech firms in a few regions citing positive outlooks for capital spending. Consumer spending firmed in most districts, but some retailers expressed caution about the outlook due to high gas prices, general economic uncertainty and price pressures from suppliers. Auto sales slowed from the previous report as some dealers continued to struggle with lean inventories caused by Japanese supply chain problems. Most residential real estate activity was little changed and remained weak, although construction and activity in the residential rental market continued to improve since the previous Beige Book. For six Districts, activity in the nonresidential real estate market has improved slightly for specific submarkets, although conditions generally remained weak across all twelve Districts. Since the last Beige Book, overall loan volumes have increased in three Districts, decreased in two Districts, and were relatively flat, often with mixed trends across the banks’ portfolios, in five Districts. Credit quality was steady or improving. House prices continued to improve in May with Standard and Poor’s reporting the second consecutive monthly increase in both Case-Shiller composite house price indexes (HPIs) in May. 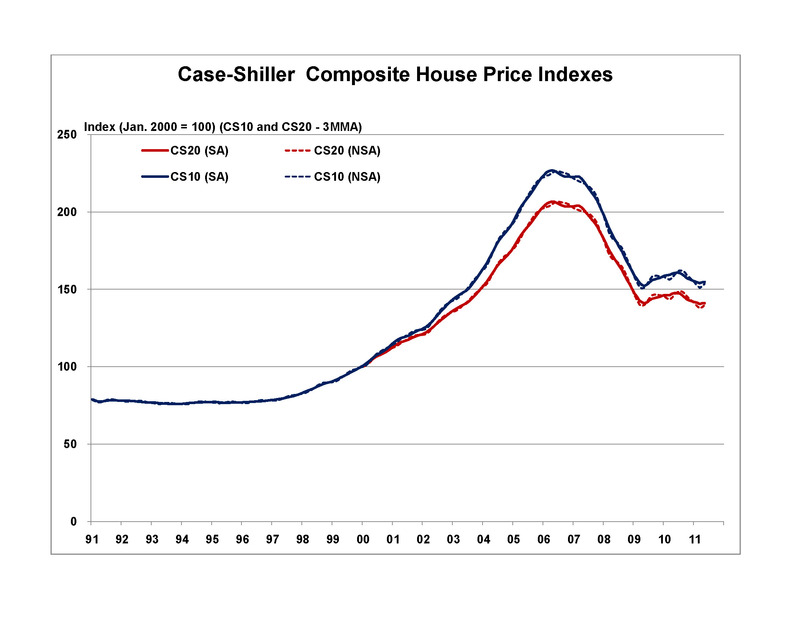 The Case-Shiller Composite 20 (CS20) gained 1.1% (NSA) and the Composite 10 (CS10) was up 1.0%. This follows a 0.6% increase in both indexes in April, which was the first monthly increase since July 2010. Prices improved in 16 of the 20 cities covered by the index on a non-seasonally adjusted basis. The greatest improvements were observed in Boston (+2.7%), Washington DC (+2.4%), Minneapolis (+2.6%), San Francisco (+1.8%) and Chicago (1.7%). Prices continued to fall in Detroit (-2.8%), Las Vegas (-0.9%) and Tampa (-0.6%). Phoenix was unchanged. Charts that present the historical HPI data for each of the 20 metropolitan areas are available by following this link. Despite the increase in April and May, the indexes are appreciably below their year-ago levels, with the CS20 down 4.5% and the CS10 off 3.6% from the May 2010 readings. Of the 20 metropolitan areas covered by the index, Washington DC is the only city with a positive annual rate of change—up 1.3%. All others were down relative to May last year, with Minneapolis (-11.7%), Tampa (-9.5%), Phoenix (-9.5%), Detroit (-9.3%) and Portland (-9.1%) faring the worst. These year-over-year declines, however, should be considered in context. House prices in May 2010 received a boost from the increased demand stimulated in the closing stages of the home buyer tax credit. With the support of the tax credit the CS10 and CS20 HPIs were up 5.44% and 4.64% respectively on a year over year basis. The subsequent decline, which extended over an eight-month period between August 2010 and March 2011, unwound much of the gains induced by the tax credit. It is noteworthy that both HPIs are above the level of the trough of April 2009: CS10 higher by 2.1% and CS20 up 0.4%. Today’s increases are a positive signal that the price declines experienced in the post-tax credit period have subsided, and that some markets seem to be moving up based on their own improving conditions. The steady rise of the Consumer Price Index (CPI) ended in June, ending an eleven-month run of gains that started last July. The Bureau of Labor Statistics (BLS) reported a 0.2% (SA) rate of decline in the CPI for All Urban Consumers in June. Over the last 12 months, the all-items index has increased 3.6% (NSA). Gasoline prices had been driving the strong growth in the CPI for much of the past year. However, their steep rise ended in May, with a moderate 2.0% decline in the gasoline price index. The observed drop in June was more pronounced, contracting 6.8%, as the full impact of the recent oil price decline flowed through to prices at the pump. Oil prices peaked in the last week of April and have since settled around 15% lower. Nonetheless, even with these recent declines, the gasoline index remains 35.6% above its level in June 2010. Food prices edged up further in June, increasing 0.2% on a month-to-month basis. Major grocery store food groups were mixed, with the indexes for fruit and vegetables, meats and eggs declining, while other major grocery store food group indexes (such as, cereals and bakery products +0.6%, dairy products +0.5%) all increased. Overall, the food index has trended steadily higher since the beginning of the year, leaving it 3.7% above its June 2010 level. Core CPI, which excludes the volatile food and energy prices, continued its steady rise, with a 0.3% gain in June. This is the seventeenth consecutive monthly increase for core CPI, although the rates of growth over this time period have been relatively modest, generally falling within a range of 0.1% and 0.3%. The clothing, and used and new vehicles indexes were the main contributors to the core CPI increase in June, registering gains of 1.4%, 1.6% and 0.6%, respectively. Overall, with a year-over-year increase of 1.6%, the core CPI remains indicative of only modest levels of inflation. The shelter index, which serves as a proxy for housing’s component of the CPI, rose 0.2% in June, marking its ninth monthly increase in a row. Owners’ equivalent rent and rent of primary residence maintained their steady pace of growth, up 0.2% and 0.1%, respectively. In the past year, these subcomponents have seen only modest gains, up 1.0% and 1.4%, respectively. With energy prices expected to remain relatively stable at current levels for the remainder of 2011, we expect the CPI for All Urban Consumers to settle back into more moderate growth during the second half of the year, slowing to an annualized rate of 3.0% in the third quarter and 1.5% in the fourth quarter. 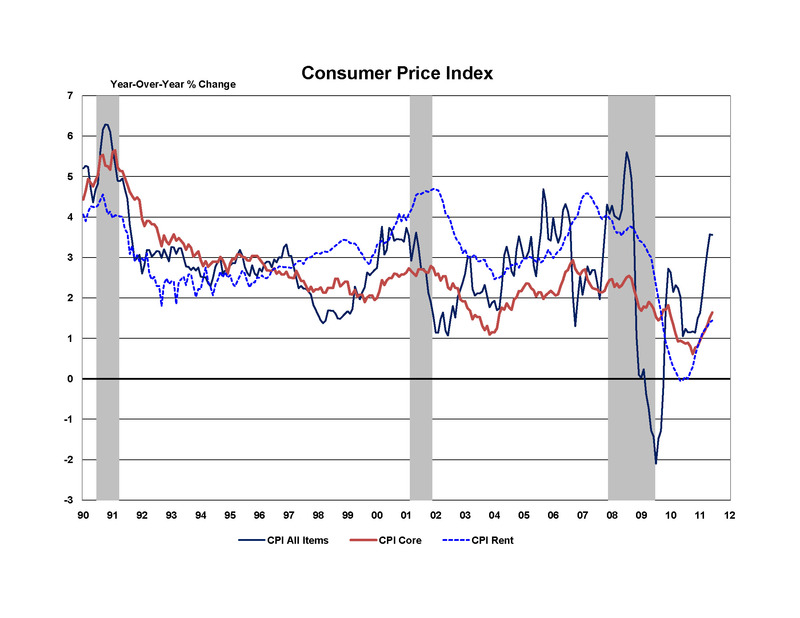 Inflation is expected to remain moderate through 2012, with an annual rate of growth in the CPI of 1.9%.